Inspired by physics and neuroscience, I make three-dimensional sculptures, or "brane models", that suggest higher dimensional space beyond three or four dimensions. "Branes", short for membranes, are lower dimensional subspaces that exist within higher dimensional space. The "brane" models also illustrate how consciousness, trapped in three or four dimensions, is shaped by the habits and subjectivity of our senses (the five common senses, as well as proprioception and the "mind"). 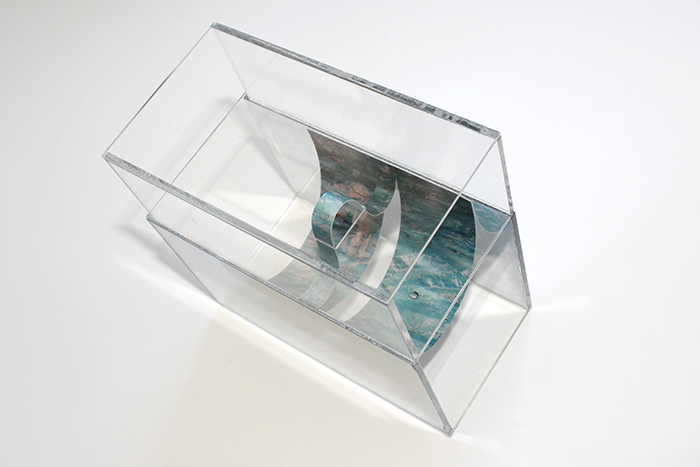 There are two modes that I currently work in: small-scale sculptures of photographs in acrylic shapes and large-scale photographs of temporary arrangements of photos, computer monitors, plastic and water. These photographs function simultaneously as two, three and four dimensions inside the negative space of a two-dimensional field. Both sculptures and photographs explore how visual perception and consciousness are pliable. I also sometimes shape the acrylic and photographs into waveforms to refer to light, especially the parts of the electromagnetic spectrum outside human visibility. I am interested in deconditioning fixed perception by drawing attention to its limitations; emphasizing how what we see is relative to our point of view and doesn't have a one-to-one correspondence with reality.